Transportation planners in the Midwest are advancing an agenda for high-speed rail while simultaneously investing in numerous corridors that have different strengths and weaknesses. To assist in establishing priorities, this paper compares the size of the travel markets in seven of these Midwestern corridors. Using a technique known as the gravity model, it demonstrates that the corridors linking Chicago to Cincinnati and Detroit likely exceed the others on the basis of total passenger traffic, and, along with the Chicago – Twin Cities route, rank at the top with respect to the passenger-miles of travel. The routes to Cleveland, St. Louis, and other locales compare less favorably. The top corridors, while shown to be only a fraction of the size of the California and Northeast Corridor routes, are found to be appreciably larger than most of the country's proposed high speed rail corridors, suggesting they have considerable potential for rail-passenger development. This study is not the first to evaluate the merits of various Midwestern HSR corridors. Several research publications offer a systematic evaluation of the strengths and weakness of various routes proposed for the region. Hagler and Todorovich (2014) use an “index approach” that considers many factors, including airport and highway congestion to rank the importance of prospective HSR corridors across the country. Their analysis ranks the Chicago – Detroit and St. Louis corridors as the highest priorities in the Midwest. Most studies advocate for the system as a whole rather than for specific corridors. 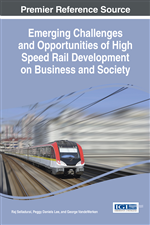 The Midwest High Speed Rail Association has done extensive analyses demonstrating the economic value of the various corridors under consideration (2011). The Federal Railway Administration has designated corridors that meet certain criteria as being eligible for high-speed rail funding, but stops short of attempting to prioritize these routes (2014). Few direct comparisons between routes, consequently, have been made. A study commissioned for the MWRRS in 2000 compares the capital costs and implementation issues affecting each corridor (TEMS, 2004). Chapter 4 of the study includes estimates of passenger travel by mode in each corridor encompassed by the system. The study, while comprehensive and the product of extensive statistical analysis, relies on data almost entirely from the 1990s to measure vehicular traffic and shies away from directly comparing the corridors according to their passenger-carrying potential. As noted later in this report, the authors of the study are candid about the measurement problems that affect their assessment of each corridor.